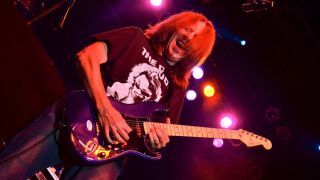 With the majority of hard rock/heavy metal guitarists seemingly trying to “out-shred” one another by the late ‘80s, Ty Tabor of King’s X offered a much needed alternative - guitar playing that was tasteful and melodic…yet also technically proficient, as evidenced by such classics as Over My Head, Summerland and It’s Love. Below, he lists five albums that helped shape his six-string style. Number one on the list because it had such a profound effect on changing my view of playing guitar - probably like nothing else I had ever heard before - is the very first UK album, with Allan Holdsworth. I had never heard anybody think about playing guitar the way that he plays on that record. It has become a style that we are all familiar with now, but at the time he was the creator of his new thing, that influenced everyone - from Eddie Van Halen to anyone you’ve ever heard of that’s a real rock guitarist. This is another brilliant guitar album, from beginning to end. The reason that I gravitated towards it was because it was blues on eleven. I’m definitely a blues-influenced player: that’s where all my licks come from, and the blues are the foundation of what I play. But when I heard Johnny Winter play incredible, aggressive blues through a wide-open Marshall… I’ll just say I never heard blues taken to that level of hard rock. And it was just what I wanted to hear. Everything he was playing was what I wanted to play, so I learned a lot of his licks on that album. It’s just a very unique and stellar moment in his career, where things really came together. I’d have to throw a Beatles album in there somewhere, because of all the tones and sounds. Matter of fact, I’m going to list an album that is only an American release - it’s not even an official British release - called Yesterday and Today. And this particular American release is another brilliant guitar album, to me. The tones - they were doing backwards leads - I’d never heard that kind of thing before. The killer guitar tones on that record are ridiculous. Kiss Alive! would have to go in there, just because of Ace Frehley. I tried to learn everything that Ace did on that record… I did learn everything that Ace did on that record. I learned every lick of every solo when I was a kid. It was a huge influence. The reason it was such an influence was that the solos were like melodic vocal parts to an album, rather than just guitar solos. They’re very musical solos - with great style and great choice of notes. This album for just straight-ahead rock’n’roll guitar is quite possibly the most overlooked rock guitar album of all-time. Brilliant guitar playing, rhythm-wise and tone-wise, [courtesy of the late Mel Galley]. An off-the-charts performance from Trapeze all round. The Guitar Heroes Quiz: how well do you know rock’s greatest six stringers?